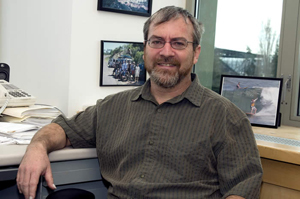 Professor Gelb’s research is in the area of medicinal enzymology. All of the enzyme systems under study are medicinally important. The lab is comprised of researchers with a wide range of expertise. Thus, students will gain experience in or be exposed to a number of techniques including synthetic organic chemistry for the preparation of enzyme inhibitors and proteomic reagents, purification of enzymes using conventional and novel approaches, protein chemistry techniques for determining protein modifications, recombinant DNA approaches for the over-expression of enzymes and enzyme alteration by site-directed mutagenesis, and animal cell culture for the analysis of enzymatic processes in living cells. The Gelb lab works in 3 areas: 1) Phospholipases A2 and inflammation; 2) Development of anti-parasite drugs; 3) New methods for screening of genetic diseases and for quantification of proteins in complex mixtures. Phospholipases A2 catalyze the breakdown of phospholipids in cell membranes. There is currently a lot of interest in this class of enzymes because they release arachidonic acid for the biosynthesis of eicosanoids and are thus important in promoting inflammation. There is medicinal interest in these enzymes both in universities and in pharmaceutical industries. The Gelb lab in collaboration with the lab of G. Lambeau (IPMC, Sophia Antipolis, France) has cloned a number of novel human and mouse secreted phospholipases A2. Structure, function, and regulation studies of these enzymes is currently an intense area of research in the Gelb lab. The work involves structure-based design and synthesis of phospholipase A2 inhibitors, studies on the role of these enzymes in eicosanoid biosynthesis in mammalian cells, and the use of knockout mice to study the role of these enzymes in inflammatory diseases such as asthma. In the late 1980s, the Gelb lab together with Professor John Glomset and colleagues discovered a new type of protein modification called prenylation. Certain proteins in all eukaryotic cells contain either 15-carbonyl farnesyl or a 20-carbon geranylgeranyl groups. Currently the Gelb lab is involved in a multi-laboratory team at UW to study protein prenylation in a number of parasites that cause devastating diseases in the tropics (Malaria, Sleeping Sickness, and others). The biochemistry of protein prenylation in these parasites is being studied. Structure-based approaches in combination with combinatorial and multiple parallel organic synthesis is being used to develop potent and specific inhibitors of parasite protein farnesyltransferases. The Gelb lab is also working on other targets for the development of new anti-parasite drugs. Finally, the Gelb lab has been developing new technology for quantitative proteomics. In collaboration with Professor R. Aebersold (Institute for Systems Biology), the Gelb lab has developed Isotope-Coded Affinity Tag (ICAT) reagents for the quantification of proteins in complex protein mixtures. These proteomics reagents are now used by thousands of labs worldwide, and efforts are underway to develop the next generation of ICAT reagents. A related technique developed by the Gelb lab in collaboration with Professor Frank Turecek (UW Dept. of Chemistry) is the use of tandem mass spectrometry for the simultaneous analysis of multiple enzymes of clinical importance. This technique is revolutionizing the diagnosis of inborn errors of metabolism. Pilot studies that make use of the new technology are being carried out in several newborn screening centers worldwide.